I used clear water to wet the lemons with a nice, juicy puddle. As the water soaks in it will have a sheen, but it won't run over the edges if you tip your paper. This is the stage when you can begin to drop in strong pigments - strong because the water will dilute them. Be sure the pigment is not so thick that it doesn't blend and spread. 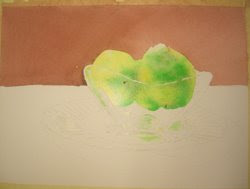 With practice you will get a feel for how much pigment and water to use. The pigments should be strong, but wet. I used Aureolin Yellow and Sap Green for the first application here. Let the water do the work for you. Don't over-brush. 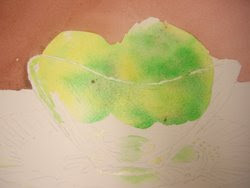 Just drip the pigments into the areas where you see those colors and let the edges blend as they will. If you want to move it around at all, tip your paper to direct the flow of the pigment. You can add just a small touch of Burnt Sienna into the darkest shadow areas - just don't over do it. Allow this to dry thoroughly before the next step.